Here’s a thing I have to deal with whenever I review a commercially successful, critical darling: GUESS WHAT, YOU SHOULD BE READING THIS BOOK. I’ve loved Saga for a what seems like a million years, partially because it’s handled by one of the best modern writers in comics and, also, in addition to that, one of the best modern artists in comics. It’s common for me to come to this column with a general feeling of “why aren’t you reading this already? !” And hey, I realize that might not be fair: maybe there are Last Week’s Comics readers coming across this column right frigging now, and figuring out how all of it relates to their comic book pull list. In any case, here’s where I come down regarding Saga: do you enjoy sci-fi storylines that are off the beaten path? Do you like understanding any given character as a fully developed person? 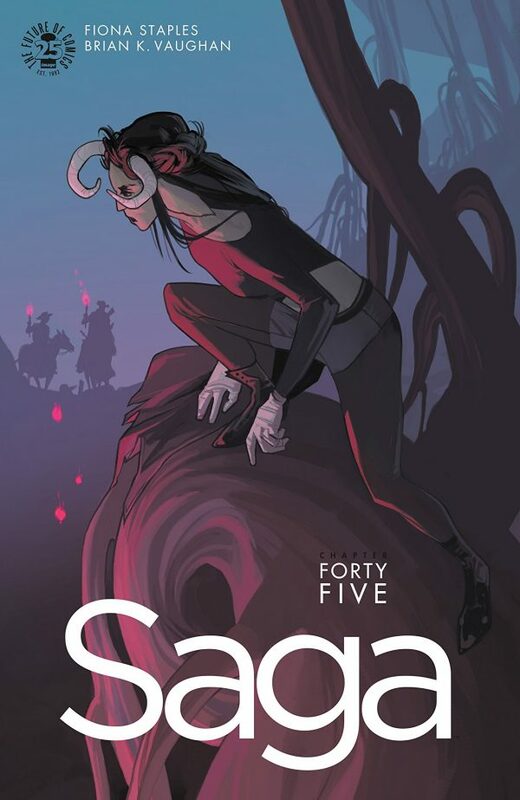 Well guess what: Saga is for you. The last issue left us in this weird place where Hazel, our narrator, didn’t exist – but this issue lets us know soon enough that she’s there, as always, and the new character who’s designed to be a complete shock is a temporal entity that drains one of our beloved main characters to the point where everyone’s worried about her health. What would Marko and Alana’s unborn son be like? Well, even though the fetus is dead, Alana can apparently magically project an interpretation of who he would be. What does that mean in regards to reality? Is this who he would be or is it only what his mother imagines? What does it mean for Marko and Hazel to see a tangible projection of their son/brother? Does everything change once we realize this is entirely Alana’s idea of who he would be? But, as she says, “how could I?” when it comes down to “stopping” the projection and taking it away from her family. Eventually, the spell becomes too much for her heart, and the boy fades away even as Marko explains to Hazel that she needs to be to one to save her mother. Alana’s heart needs an electric shock, see, and Marko’s magic is too much. So he explains to Hazel that only she can save her mom – an intense request, no matter how strong she may be. Hazel nails it, which is to be expected, but I can’t help but wonder what long-lasting effects this magic will have. Marko remarks how resilient kids are in this very issue, but I would argue that it’s still not the best to throw them into intense-decision-making situations any sooner than you have to. When you look at Hazel, who’s seven-ish, and say, “you have to save your mother with magic you’ve never used before,” what pressure are you putting on this child? How does that effect her in the long run? We obviously won’t know for some time, but I love how Saga doesn’t shy away from these questions. This is a long-running series that has proved its worth time and time again, and yet still asks questions that can flummox a modern-day mind. Bankshot keeps us in a world of espionage and double crossing black ops, so it’s not too far afield from Mayday. Where Mayday was a head tripping action-adventure book, Bankshot seems to be more visceral, what with the promised punches-in-face and explosions. Issue #2 slows the action down and gives us some back story on the mysterious Marcus King, the mercenary made… mercenary? He’s still a soldier for hire, but now he’s more on the side of the good guys. Maybe that’s not true. It seems that he’s now more comfortable with his mercenary self and is going after a deserving target. This wouldn’t be an De Campi story without some bug f#$% craziness, but we haven’t gotten to the full-on crazy yet. There are jet packs and nanotechnology that can make quadriplegics walk again. But, fellow De Campi fans, you know things are going to go downhill quickly and badly. And by that I mean gloriously and bloody. 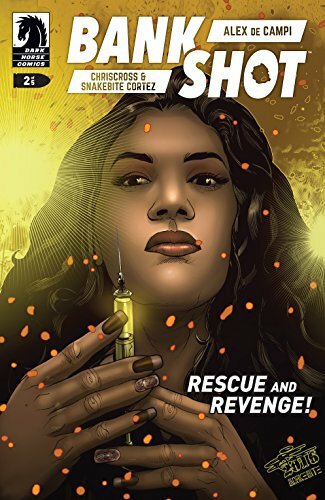 Bankshot is a five-issue mini series (my preferred format) so things will stay tight and tense. Expect more intrigue, explosions and flying body parts from said explosions. Do yourself a favor and grab the first two issues and follow this crazy train through to the end. I’ve not been disappointed by a De Campi story yet. The Riverdale Gang is back in a classic style (albeit with a slightly modified twist). Your Pal Archie # 1 features two all new stories and one classic Betty and Veronica story. It’s been about two years since Archie Comics embarked on their New Riverdale reboot and things have been going pretty well for them. Jughead won an Eisner Award and the Mark Waid/Fiona Staples Archie series clearly has an influence on the CW’s Riverdale TV teen soap opera. It was only a matter of time before the All-American redheaded teenager that birthed them all came home to roost, and who better to draw the Riverdale Gang’s return to all ages form than Dan Parent? Your Pal Archie # 1 starts with Jughead learning to drive. Of course, the hamburger fiend gets kicked out of every driving school in the area so it’s up to his pal Archie to teach Jughead the rules of the road. The next story involves Veronica turning down a date with Archie for a night at the opera with some rich lunkhead. Archie’s solution? He’s going to write an opera! Your Pal Archie # 1 is classic Archie through and through structurally and it’s a blast. As for the look, well, it’s quintessential Archie with some minor updates. Dan Parent’s storytelling takes advantage of the standard size comic. His panel layouts are a lot of fun and it’s clear how well he knows these characters and how much he loves them. His updates of Archie, Betty, Veronica and Jughead are all instantly recognizable. There are a few design tweaks here and there. The characters’ general fashion is updated. Jughead has a little goatee. 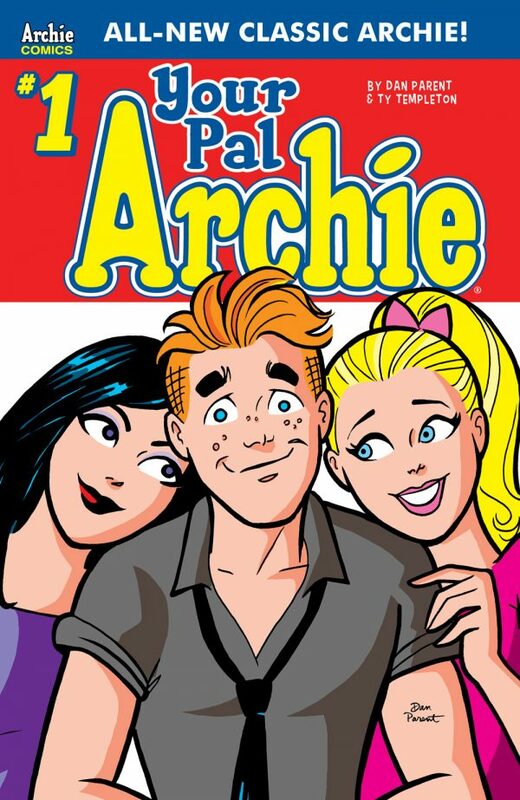 Archie, Betty and Veronica have slightly different hair that falls more in line with their current television counterparts. The tone is pitch perfect and dovetails nicely into the classic Dan Parent digest style story where Betty and Veronica meet a familiar looking genie. It’s a hoot! I am glad we live in a world where Your Pal Archie, Archie and Afterlife With Archie can all co-exist and celebrate these characters in vastly different, yet oddly complimentary ways. So if you missed this last week, go snag it this week!